Chassis is the first and only men's care line specifically formulated for better performance "down there." After preparing your sensitive areas with our Chassis 5-in-1 Shower Primer, protect your skin with Chassis Restoration Cream. This premium cream soothes, protects, and restores skin worn down from your daily grind. Preventing chafing and other irritation caused by prolonged friction is an important first step to preventing the damage that's being done on a daily basis, but healing and restoration is also essential. 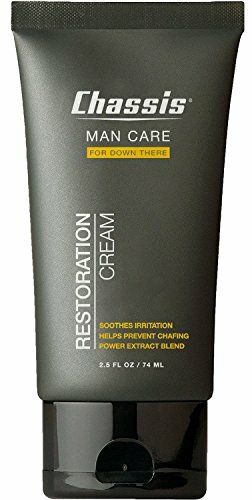 Our Restoration Cream does it all, and is the first product designed specifically for a man's private areas. And, because those areas are exceptionally important, Chassis Restoration Cream, like the rest of the Chassis product line, contains only the finest ingredients and is free from talc, aluminum, menthol and parabens. It contains our proprietary Power Extract Blend, which includes natural ingredients like witch hazel, oatmeal, hops and pumpkin seed extract, to harness the power of natural, premium ingredients. Chassis Restoration Cream is essential to feeling comfortable, smooth, and protected all day long. POWERFUL RELIEF - Soothes skin irritation in men's most sensitive areas. Instant calming for even the most delicate skin, and relief for skin that's inflamed from friction and chafing. PREVENTS CHAFING - Extreme protection for extreme situations. From the gym to the office, hectic lives requires men's care products that can keep up. We've got your back (and your front) with our innovative Chassis Restoration Cream. Stay friction-free all day long. POWER EXTRACT BLEND - A proprietary blend of premium, natural ingredients including witch hazel, oatmeal, hops, and pumpkin seed extracts protect and nourishes your skin. Our products are free from talc, aluminum, and parabens. ALL-DAY PROTECTION - Run a meeting or run a marathon: you're covered. Never worry about chafing or irritation again with our long-lasting protective cream. MOISTURIZING - Keeps your skin in premium condition, so it's touchably soft while still staying protected.